I was not prepared for a story about homelessness to include two lovely song birds. But that is what Pat Moran and Eula Jane Wyatt’s music and Wyatt and Christine Rodgers’s voices produced Saturday night during the final performance of Elizabeth Gjelten’s “Hunter’s Point.” The play with music was produced by Strange Angels Theater and presented at St. Boniface Church Theater. The songs, sung solo and duet, centered on Biblical redemption, in earthy, moving tones. Eva, played by Wyatt, is homeless, occupying a tower in an area of Hunter’s Point, where shipyards were once active. She rides a bicycle and spends her days at the public library conducting research to find the perfect home, a utopian community, where psychiatrists and social workers do not enforce harmful drug regimens, where she can consume the essential nutrients that will bring her to wellness. Her sister Ruthie, played by Rodgers, keeps in contact by cell phone, maintaining a bank account for Eva’s use. Eva is determined to be alone, it is safer that way. She avoids speaking to her sister. Her past is troubled and marked by horrible psychic disturbances which the audience gleans through the dramatized voices from Eva’s mind and dialogue provided by Ruthie and Eva. At the outset of the story, Ruthie must tell Eva firsthand that their father has passed away. She finds an individual known simply as Hunter, played by Carlos Aguirre, to locate her sister. Hunter makes his money illegally on the street performing gifted beat box rhythms, which the audience enjoys several times during the evening. Aguirre also plays a Sarajevo resident, Zulko, who befriends Ruthie during her business trip there to write a piece for an online travel guide enterprise. We learn that Ruthie is continually on the move across the globe, not just in her role as a journalist, but more importantly because of the rootlessness which constitutes her life. For three days now I have been assisting a homeless woman’s move into temporary shelter. And she has lots of money. Shaughn, the former building manager at 50 Golden Gate Avenue, hired me to first rearrange her possessions, located in the storage area of a parking garage on Hayes Street. I was lured by tales of the El Dorado of her misfortune, as I learned that Shaughn was paying $40 per hour for assistance moving her possessions out of an apartment in the building last Friday. By the time I came to her aid on Saturday, the rate had dropped down to $15. According to Shaughn, her landlord (and former employer) had bought out her lease and she had until 4:00 PM on Friday to vacate. By her own words, she was “desperate” for the check she received in compliance. Shaughn has the storage space for thirty more days. What I found there belied the fact that she had spent two weeks with hired help packing. Granted, much of what I did not see had gone to storage in Novato. But what remained looked to be so shabbily packed as to suggest a total lack of managerial organization. Personal belongings, including a wardrobe, were piled against a square corner area, wedged in by parked cars and concrete pillars, just outside the storage unit. Within the storage space there was even more confusion. On Saturday we sorted and moved boxes and large objects into a shoddy semblance of order. While working, I asked Shaughn about her origins. As we lifted skirts and sweaters, blouses and coats, that had fallen off hangers and out of sheeted bundles onto the garage floor, and hung them from a water pipe near the ceiling of the storage unit, Shaughn recounted her beginnings in a rural, mountain town in Virginia. One of nine children from a father who had remarried several times, she seemed to gladly revisit the time when domestic industry revolved around women who baked apple, pecan, and cherry pies. As a maturing child, she graduated from chores in the house to chores in the field. She enjoyed the trips to her aunt’s where canning provided enough food for ten for the winter. I could tell she was quite capable with her hands and had a load of tools stored for any need. She talked about the racism and provincialism of that community and how she would be greeted upon an imagined return, Oh, you’re ______’s daughter. I did not know where she was going next, so I asked her if she was excited about her new apartment. She then informed me she would be apartment sitting in the building next door. Shaughn explained how she would use the storage space to take photographs of antiques for listing on eBay, for she is forced to dispossess of the many antiques she amassed during former business days. I once worked with a woman in New York who collected so many chairs, and only chairs, that she had to keep them in storage. Shaughn is not unlike the chair collector, or more, aptly, aspires to be like Imelda Marcos, for all the shoes gathered in that dirty garage space. She told me that the forty to fifty boxes I saw were nothing compared to the number of shoes already stored elsewhere. The antique business belonged to a time in Shaughn’s life before managing buildings, when she still lived in a three-bedroom house in Novato, a community in “its own little world,” according to a friend who had worked in retail service there. Shaughn was forced to downsize after vacating that home. She has passed through several incarnations, including years spent as a massage therapist and the “six years too long” of the seven she served under the owner of the property at 50 Golden Gate. Over the last three days, Shaughn complained incessantly about what the packers had not done according to her directions. They were to blame for the post-volcanic chaos we sifted through. The truth of her situation was divulged while I stood with a heavy bundle of clothing in my arms, greeting one of her new neighbors down the hall with a hello. Shaughn quietly let me know that she wished not to advertise her move to the building because the sublease was illegal. She had just as many complaints about the former occupant (another illegal lessee? ), an Italian opera singer, because he was so filthy. She practically heaved her displeasure about the black hairs he left all over the tiled bathroom floor. In 2008, I readily knew that Shaughn is an individual who only looks after herself. She is ingratiatingly smooth, though. But she is also vindictive. And yesterday she talked confidently of revenge. She explained that she had a surprise for her former boss; she will sue him for $60,000 for overtime during her former job. Does misfortune ever really harm people like Shaughn? Or her former boss? Remember the bankruptcy case of Donald Trump? Twenty-five years later, I can still remember when the announcement was made to all workers at MBW Advertising in New York that the business would close in one week because the owner, Michael Weiss, the profligate son of the company’s founder, had filed bankruptcy. He and his wife were back in business several months later, no matter the rumors that overspending on cocaine and cars may have contributed to financial disaster. My great uncle Bob was a man who never recovered. His life did change, though. He lived most of his adult life suffering from catatonic schizophrenia following an episode during college that I never learned the cause of. He lived in institutional care in the San Bernardino area for many years. His sisters brought him to the house on holidays. Often he was just present without speaking or engaging with us in any other way. Other times, he was warm, but only made small talk. He was one of the most handsome men I have ever known. And I loved the gentleness of his eyes. He married a woman from the same institution named Marcella. They shared a house in San Bernardino County for about ten years and then divorced. I saw the house the day his sister Jo drove us there to pick them up. It was a long drive. The wooden slat building, with small, broken windows, was a dilapidated structure that sat on what must of been a former agricultural field. It was a lonely looking shelter in a valley with mountains in the distance. Uncle Bob was encouraged to paint while in institutional care. With impasto strokes, he painted narrow, claustrophobic street scenes, near wharves, eerily vacant of any human presence. He also painted flora and birds frozen on perches. 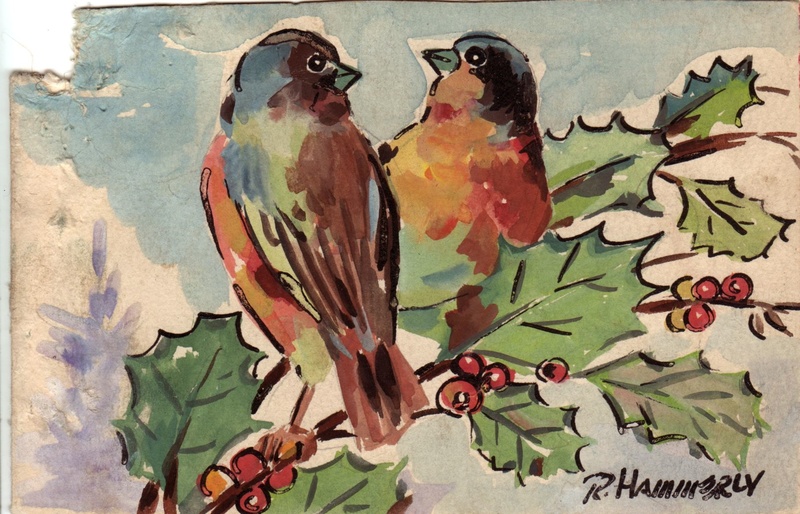 Robert Hammerly, untitled drawing, gouache or watercolor on card, date unknown.